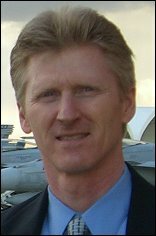 Congratulations to David Haas (BS 83’, MS 85’, PhD 89’) for his promotion to the position of Senior Lecturer in the Department of Aerospace Engineering on May 2nd, 2013. Haas has served as a part time member of the Adjunct Faculty since 1990 teaching ENAE 656 Aeroelasticity. He has published in the areas of Aeroelasticity, Artificial Intelligence, Adaptive Expert Systems, Rotorcraft Health and Usage Monitoring Systems, Flight Operations Quality Assurance and Naval Aviation History. He is a Fellow of the AHS and an Associate Fellow of the AIAA and holds seven patents. Dr. Haas is Head of the Sea Based Aviation and Aeromechanics Branch at the Naval Surface Warfare Center, Carderock MD where he oversees analytical projects and experimental aerodynamics testing conducted in the Center’s 8x10 foot Subsonic Wind Tunnel facility. In addition to working with students at the University level Dr. Haas is also active with STEM outreach initiatives with high school students.